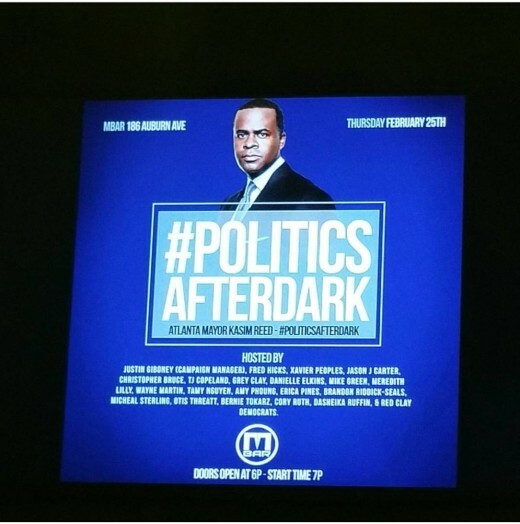 Atlanta’s Mayor Kasim Reed is motivating the city of Atlanta to become engaged in city politics by kicking off the first of a series of events called Politics After Dark. The dope event was held at Atlanta’s M Bar located on the historic Auburn Ave. Hundreds came out to support the Municipal Option Sales Tax Campaign known as campaign M.O.S.T which kicked off at this week’s #PoliticsAfterDark series held weekly at M Bar on historic Auburn Avenue. With the 2016 Presidential Election looming, Atlanta culture progressives, Xavier Peoples (Co-Owner of M Bar) and Jason “J. Carter” Carter (Founder of ONE Musicfest) created #PoliticsAfterDark to engage Atlanta’s community of influencers, curators and millennials with civic leaders charged with being change agents for social good. The Municipal Option Sales Tax is a 1-cent tax that applies to most goods purchased in the City of Atlanta. These funds allow visitors and business people who use the City’s water and sewer infrastructure but do not pay City water/sewer bills to help pay for upgrading and maintenance of the infrastructure. This is NOT a new tax; it is the reauthorization of an existing tax. The Municipal Option Sales Tax vote will be held on Tuesday, March 1, 2016. Don’t forget to ROCK the vote Tuesday! Ludacris & Mayor Kasim Reed Bring in The New Year With The Peach Drop At The Underground! Kasim Reed Elected Atlanta’s 59th Mayor!